It was our 12th Wedding Anniversary and we both decided to spend this day together in a different way and cherish the memories. We looked for places and finally decided to go Harihareshwar on our Royal Enfield Bullet. We started the ride on 24th Morning at around 11 o’clock and reached to Panvel around 12.30 pm. We had a short break their and re-started our ride again. There I felt that this time our ride is different as we both were alone and other team members were not waiting for us at Panvel (as they do for other group rides). So it was our first Solo ride. I realized that we have to be more careful and be supportive to my partner for any situation, as there were no team members to help us. 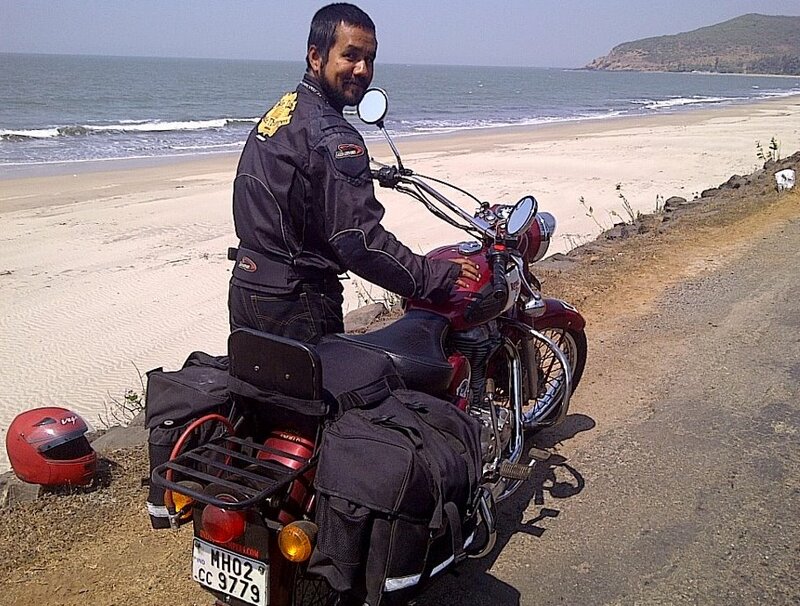 We started our further ride on Mumbai-Goa highway. It was a sunny, bright but pleasant day. As usual the road had traffic. Many people noticed us due to the sound of bullet. We directly took a halt at Mangoan around 4 pm. We had lunch and moved towards Harihareshwar. Now the road was not so good and was with very steep hikes. I realized my husband is driving differently as compare to other rides. He was more careful and cautious. We reached Hariharshwar around 6 pm and got freshened up and visited Harihareswar temple. We went to sea shore, it was very beautiful site. The water had started rising, the sun was saying bye-bye to us. The sea was aggressive with high tide. It is said that Harihareshwar Sea is the symbol of Hari (Vishnu) who has taken clam swapoor and Hareshwar (Shiva) who has taken Rudra (aggressive) swaroop here. It is a magic of the nature that I got lost into its beauty. As the moon rose the site became more beautiful. We stayed there for the night in small hotel (Om Shree) which is comfortable. Next day (25th) we left Harihareshwar around 11 o’clock and decided to ride back from different route. We decided that we will go to Diveagar, then Murud-Janjira Fort and from there Alibaugh and Mumbai. We reached Dive Agar around 12:30PM, took darshan of Shree Ganesh. Then we went to Dighi port via Aaravi beach. Dighi port has a launch to Rajpuri or Agardanda. We reached late to port and missed the launch to Rajpuri. So we had to take launch to Agardanda ride to Rajpuri and from there a small boat took us to Jangira fort. Travelling by this route was fun, as we can sit more relaxed in a boat without worrying about roads and traffic. I was again lost in the vastness of the sea and nature. Visiting Janjira fort was nice experience, it again showed us the magic of nature with a water pond in between the fort island surrounded by salty sea. We came back to Rajapuri and started our further ride. We planned to go Alibaugh, Rewas. From there we wanted to take launch to Mumbai. We had some food (vada-pav) in Rajapuri and there we got information that the last launch would be at 7:00 pm from Rewas. Time was less and reaching Rewas was difficult so we decided to ride by road, from Alibaugh, Vadkhal, Panvel, Mumbai. We rode non-stop (only a short break at Alibaugh for tea) till our house. After Vadkhal the road was again with traffic, pollution. We reached Panvel and from their we took Thane – Ghodbandar road and reached Borivali around 10.30 pm. I reached home and soon was back in my normal routine. So this was my experience of first solo ride with husband. Travelling with group of course has more benefits, travelling alone is also an experience where you learn many things to be on your own.